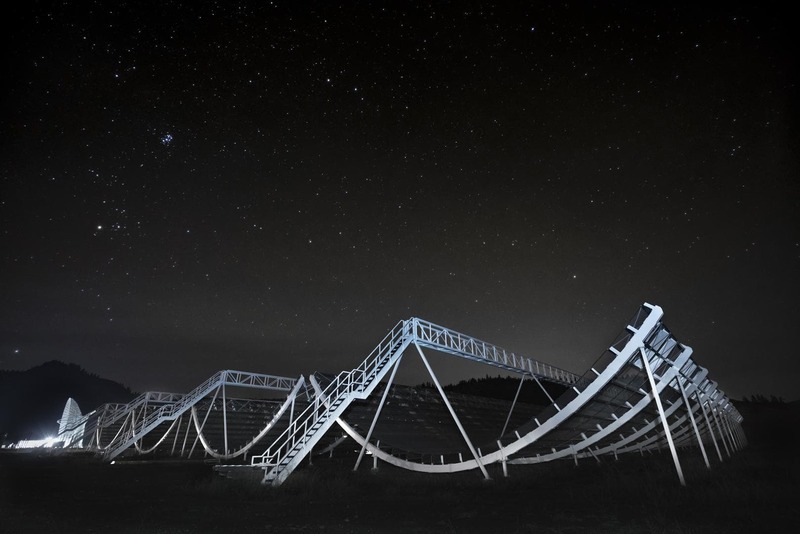 On a clear night in August 2018, a radio telescope in British Columbia called CHIME detected a pulse of radio waves from across the universe. It lasted only a few milliseconds before disappearing completely. This type of brief but powerful radio pulse, called a Fast Radio Burst (FRB), has only been detected a handful of times since they were first reported in 2007. Although the origin of FRBs is a mystery, Canadian astronomers are using a powerful new tool to detect and study them. The Canadian Hydrogen Intensity Mapping Experiment (CHIME) has detected more FRBs than any other telescope in the world, and it’s just getting started. 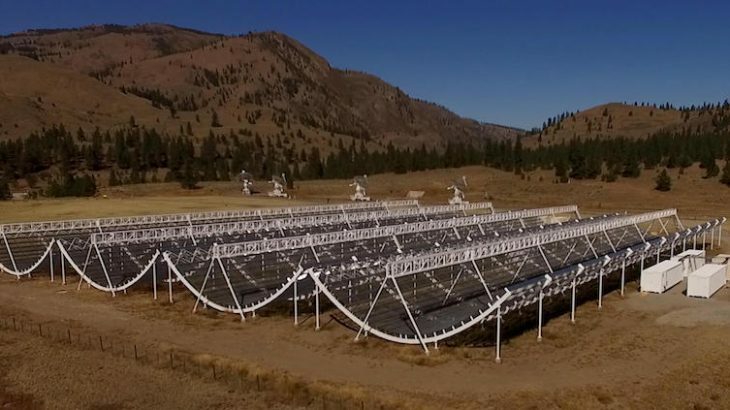 Hidden in the Okanagan Valley in BC, down a sleepy mountain road far from wineries and quaint communities, astronomers are using CHIME to unlock the deepest secrets of the universe. CHIME is an international collaboration co-led by the University of British Columbia, McGill University, University of Toronto, and Canada’s National Research Council (NRC), with several collaborating institutions across North America. At the NRC-run site called the Dominion Radio Astrophysical Observatory (DRAO), CHIME is operated in a radio-quiet environment. Regulations across all levels of government protect the site from man-made radio interference such as cell towers, affording multiple radio telescopes a safe haven for operation and data collection. Like all radio telescopes, CHIME is designed to detect the radio waves that are naturally emitted by many sources in outer space—sources ranging from stars, to quasars, to FRBs. CHIME consists of four large 100-meter-long cylindrical arrays, each with 256 detectors, for a total of 1024 individual antennas that monitor a huge swath of the northern sky. Each detector logs 1000 observations per second across 16000 distinct radio frequencies between 400 and 800 Mhz, for a total data throughput of 13 terabytes every second! Since radio telescopes don’t need darkness to operate, unlike a typical optical telescope, CHIME can operate 24 hours a day, constantly monitoring the skies and collecting data. The detection of FRBs is only one of CHIME’s lofty scientific goals. The low frequency of the instrument allows it to observe diffuse hydrogen gas in galaxies throughout the sky. Since the light from distant galaxies takes a long time to reach Earth, we are effectively seeing them as they looked in the past, with the most distant galaxies appearing as if they just formed. By mapping the gas in both distant and nearby galaxies, astronomers can determine the expansion rate of the universe throughout its history, giving insights into the effects of Dark Energy, which is responsible for the accelerating expansion of the universe. CHIME will also constantly monitor up to 10 pulsars in the sky. Pulsars – fast and predictably rotating neutron stars – keep time incredibly well over millions of years. By counting their radio pulses over weeks and years, astronomers can perform a variety of measurements and experiments, including tests of relativity and a search for gravitational waves. Pulsar timing was used on the Voyager golden record as a map to Earth. If an alien civilization finds this map in the distant future, they can locate the 14 pulsars with specific rotation speeds and create a 3D map with Earth in the center. With 13 terabytes of throughput each second, CHIME captures as much data in one second as the average person views in a year. 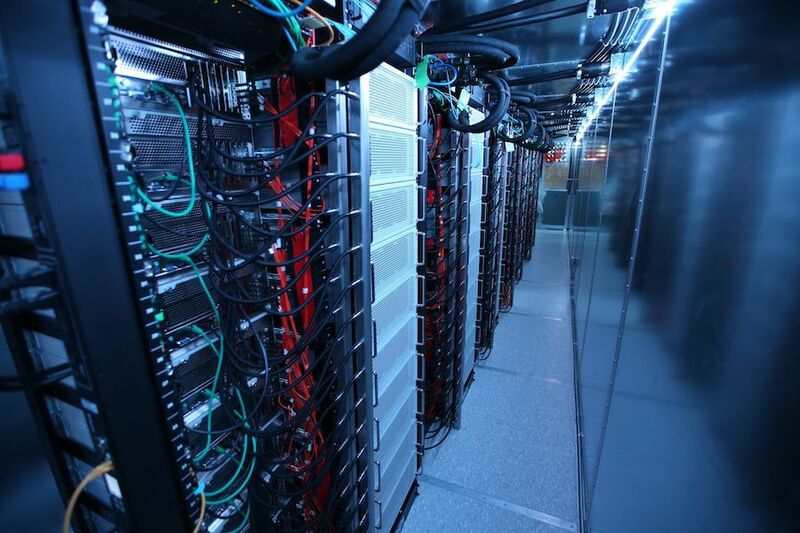 It uses a high powered supercomputer located in a shipping crate beneath the array to interpret this data in real time. It also has a built-in rapid response system, meaning CHIME can detect a new FRB and instantly send a notification to the science team and the wider astronomical community for follow-up with telescopes around the world. If it can be caught quickly, other telescopes can observe the event in a variety of wavelengths across the electromagnetic spectrum to try and determine its origin. This type of rapid response is used in the astronomical community to study a variety of significant astronomical events. In 2018, the LIGO instrument detected a gravitational wave event, and through the rapid notification system, astronomers were able to trace the source to the merging of two neutron stars in a distant galaxy, an event that would have gone unnoticed otherwise. Why is CHIME perfect for solving the FRB mystery? FRBs have been puzzling astronomers since their discovery. Because they occur randomly throughout the sky, last only a few milliseconds, and rarely repeat, they have been incredibly difficult to identify and study. They are like a sea monster to an ancient sailor – big, powerful, and beyond our current understanding. Of the 80 confirmed FRB detections, only two have had a repeating pulse. Astronomers were able to trace one of these to a dwarf galaxy beyond the Milky Way, supporting the idea that they travel a long distance to reach Earth. However, little is understood about FRBs, and many more observations will be necessary before astronomers understand what causes them. With its 24-hour monitoring of the sky and rapid response system, CHIME is the perfect instrument to capture FRBs. In just two months of operation in the summer of 2018, CHIME detected 13 new FRBs. This result was surprising, especially since CHIME’s frequency range is lower than most of the previous FRB detections. This indicates that FRBs are more likely to occur at these lower frequencies, making CHIME’s frequency range ideal for future discoveries. With the potential for many FRB detections in the future, astronomers hope to use data from CHIME to narrow down the potential sources for FRBs, define their properties and gain insights into the environments that produce these strange and powerful radio pulses. After only a year of operation, CHIME is proving to be a huge success. Aside from the attention received for its FRB discoveries, CHIME is providing an international collaboration of astronomers with a massive data set that will push the limits of our understanding of the universe, proving once again that Canada is a world leader in astrophysics research. Physics and Astronomy, Technology & Engineering CHIME, DRAO, Physics and Astronomy, Ryan Marciniak. permalink.